Disclaimer: This guide will not guarantee any stars at all, you might just be an inexperienced attacker, it will defenitely need some practise and GoWiPe fails sometimes even for the best attackers. Use this guide to your own interpretation and use it how you feel it works best, because a lot of variants are possible. This strategy is NOT recommended to get 100%, other compositions will be better for this, you're really going for the 50%. Okay guys, I'm a TH9, and wanted to make a GoWiPe guide to get 2 stars on every TH9 I've seen so far in clan wars. 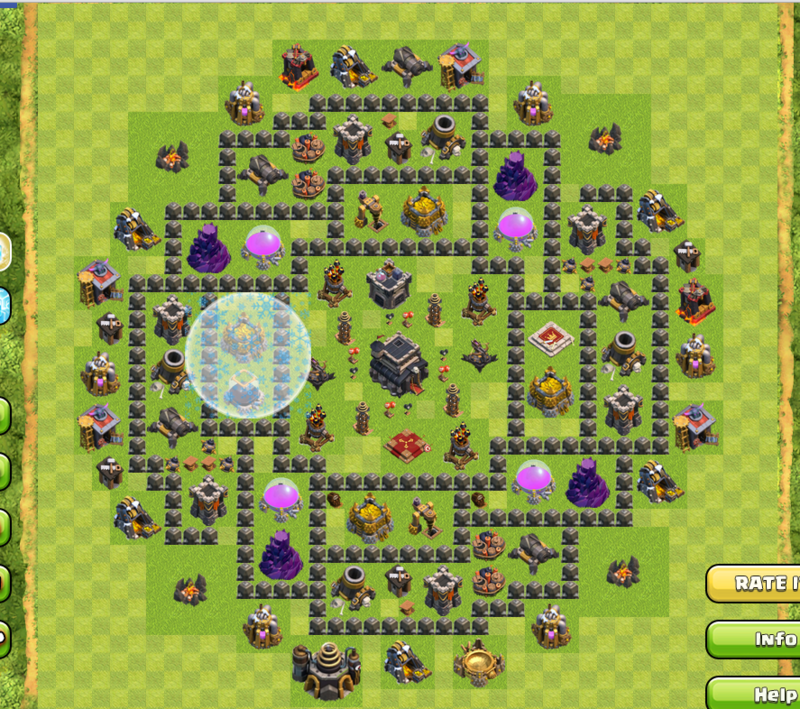 If you're ghosting (not allowed, not recommended) with maxed troops, I can guarantee you can get 2 stars on every one. Of course, in reality, you may fail because of unexpected teslas, you don't have maxed th 9 troops yourself, you have weak troops in clan castle, or simply because it's a strong base design that would need practise (ghosting) which obviously you can't. The first thing you should do in clan wars is discussing which base you should attack and selecting one that you think your GoWiPe attack would go well on. What you're going to build exactly depends highly on the victim. Normally, in your spell factory, you'd build 2 rage, 1 heal, and 1 jump spell. For some TH9's, that have weird designs, a jump spell might not be needed and it can be done with wallbreakers. For others, you might want to replace the heal spell with an extra jump spell, altho I've never really seen or done this. If you think you have enough spells with 1 jump spell and 2 rage, you can also replace the heal spell with a lightning (recommended if you KNOW there's archers in the CC) to kill the CC troops. You're sometimes bringing wallbreakers, depending on the victim. If you have 2 jump spells, i'm guessing you're not going to use them. If you're bringing none at all, it really depends on the base, if you think you can break it all open with 8 wallbreakers that's fine, I've one time even used no wallbreakers and no jump spells at all because he had a weird ineffective funneling base. I'd recommend, if you're using wallbreakers at all, to bring 2 extra. If you think you need 4, bring 6 etc. I've tried both, and really depending on the base of the victim, as well as your level of the golem, as well as what you prefer you either take 1 or 2 golems. Depending on wether you take 1 or 2 golems, and the base design you take 3-5 pekka's. I usually just bring 1 golem and 5 pekka's, which does cost a lot of purple and does take a long time to train, I personally just feel pekka's often being more usefull than an extra golem. Again, depending on the base design, I bring archers and/ or barbarians and wizards. If you're low on elixer, I'd recommend mainly archers, but generally I like to take as many wizards as archers. Barbarians are for CC luring, can be done by archers aswell so not really needed depending on the base. It's possible to replace 3 or 6 wizards with 1 or 2 witches if you have level 2 witches. This is not worth it if your witch is level 1 and is pure personal preference. Your barbarian king and queen are extra, of course you deploy them as well, you can basically count the king as pekka. Your clan castle shouldn't have anything special, can have a high level golem or pekka if yours aren't that good themself. Could also just be wizards, anything is fine really. Please read a seperate guide to lure CC. You'll be wanting to lure it for sure, or your attack will fail. You're probabely wanting to get a few hogs or giants for that, I'm leaving that up to you. First you're going to be wanting to examine the base. Where do you think the tesla's are? (usually next to the town hall). Where do you think giant bombs are? Then you want to select a corner to attack from, depending on the base. Often, this is also the corner you lure the CC troops to, because surviving wizards and archers can help then. The corner selecting is an important part. You can chose either a side, or a corner, it depends on the base. 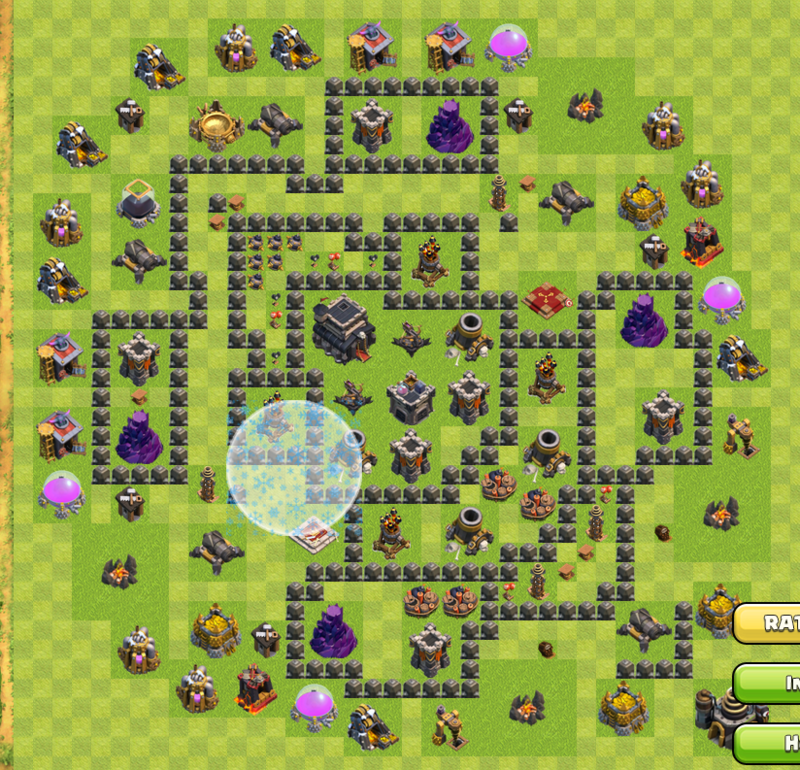 What you're usually looking for is 1 wall, with defenses behind it (so golem will go there), and then another wall, 1 line of buildings (closed section, otherwise your pekkas might go AROUND the town hall) and then the compartment with the town hall (doesn't really matter how big that area is). You can easily jump over 5 squares with a jump spell, so you're going to be wanting to throw a jump spell over the compartment-line after breaking through the first wall with wallbreakers. The first thing you do is put some archers wherever there's free buildings on the outside that are out of reach for defenses. Town hall is pretty much guaranteed, but sometimes you can fail the 50%, so this can really help for some for the 50%. Then you put up the golem pretty quickly followed by a few wallbreakers. He'll be tanking, after all, what is he for otherwise? If you have 2 golems you can put them both on the same place, or you can try to double your attack. If you're doubling, you usually take a corner instead of a side, and you put 1 golem on each side of the corner, break both of those sides open and throw a jump spell after that. But back to attack. You're NOT going to be wanting to deploy your pekkas immidiately. They'll just go towards the outer buildings around the base. You want to deploy a few of your wizards to clear up. Please note,those wizards are mainly so that pekkas dont go around, you don't have to clear up the buildings right in front of the golem because that's the path you want the pekkas to have so you can actually use those to guide them. Say you're attacking from the bottom, you want to put the wizards on the left and the right of the golem. Sidenote: If the buildings are far off the wall, sometimes 1 archer is enough to kill them. If this is the case, first clear out some outer buildings to get a path, and only then deploy the golem. Then, when a few of the outer buildings are gone, you put your pekkas and king behind the golem. This should be fairly fast after deploying the golem, often the golem has about 25% of his hp off at this point and was there just to tank the wizards. Make sure to guide the pekkas into the compartment you broke open, and put the jump spell immidiately after putting the pekka's and king. The jump spell will last long enough, if you're scared your pekkas don't follow the path you want because your jump spell came too late then it's also fine to put the jump spells before you deploy the pekkas. Once the pekkas are a little bit in, you can rage them up. My first rage spell tends to be almost ''on'' the jump spell, around there, to get them to that town hall fast. The second rage spell will be near the town hall. The healing spell should be around the second rage as well, while they're still clutched together, or you can use the heal on your wizards/queen. Now deploy your queen and a line of wizards behind. It's best to try to get them into the core, because skeletons etc. can be really annoying to deal with for pekkas so a queen and wizards will help there. The longrange of the queen tends to clear outer buildings, behind a wall that the pekkas wont go for. 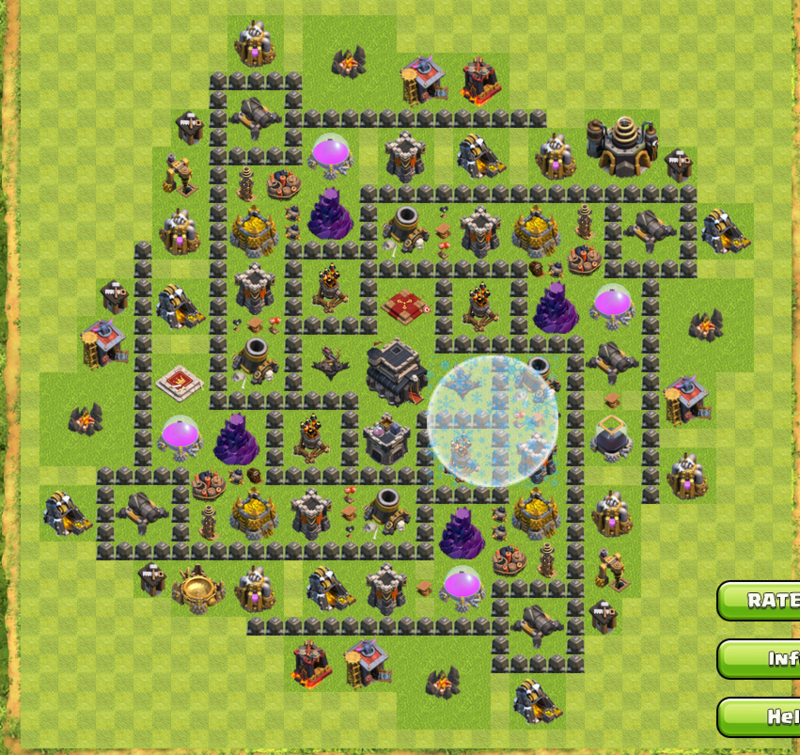 I will be showing some images of how I'd attack the most popular TH9 war/defensive bases, since obviously those are the strongest and most used so those should be good examples. I have selected this corner because it was the only one where pekkas wouldn't really be distracted by anything. The freeze spell is the same range as the jumping spell, so I've used that. What you do, in this base, is take 1 golem. You put it underneath, followed up by 2 wallbreakers. That should toggle one giant bomb already, by the golem, which can easily handle it. You then put 2 wizards per army camp left and right, and make sure you clear that research lab and elixerpump aswell. This way the pekkas can't get distracted. You put in your pekkas, rage them up near the freeze spell and get them towards the ''second compartment'', the resources this time. You take the resources, the jump spell will get them to the compartment with the town hall. Rage the pekkas up and they should be able to get the town hall. Follow up by the queen and wizards to take out the archer towers to your left and right and should help clearing the resources etc. This is supposedly one of the best anti-gowipe bases there are. I've got to strongly disagree. You put a golemon the left, clear out some junk next to it, put a few archers on the top left and right and bottom right to get some free percentates and one jump spell willl get you into the core. This is one of those examples where you don't even need wallbreakers. Protip: Only clear out the buildings on the right and left, not the one in the bottom left corner. IF you take out the drill and army camp on the bottom and the barracks on the left you should be able to let the pekkas clear out the rest and dig their own way into the base. Again a base where you don't need wallbreakers. Deploy golem bottom left, let it go towards the archer tower, clear outside buildings and follow up by pekkas. Jump spell will take them to the core. This one is trickier. Altho you basically don't do anything different than before. You put up the goelm on the bottom, clear out outer buildings and follow up your pekkas, rage them up and get them to the town hall. This were the top 4 war bases and I can guarantee you I'dget 2 stars on all of them, even if they were maxed TH9. You should be able to do this, goodluck, don't forget to lure the CC and have fun :). Informative update here you shared with us that would be supportive to get know about the gaming facts. Through the sharing professional paper writing service update on your website. The number of gamers able to get aware about the game design and its advanced features. I am pretty sure commandpromptwindows10 in the new version of the operating system is very easy and better then the previous windows and also easy for the good connectivity. You have to ensure the quick way fo the oerate it. And according to the survey command prompt admin windows 10 is best online guide. I like the guide and I like the use of pictures. Great work. 5/5.